Our pets are our children and we want them to be as happy and comfortable as possible, and if your pet is a cat and you live in a modern home, you cat will want to hang out with you in your living room, bedroom, kitchen and anywhere else you spend time. This means that your choice of cat bed will either look beautiful in your space, or not so much. 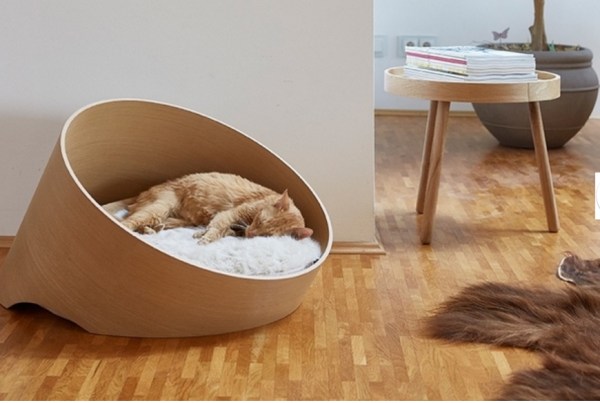 To help you find the right choice for your home we have put together a selection of 20 chic and cozy cat beds, from natural wood finishes to bright and sassy colors in a variety of materials and looks. Read on for ideas and sources. 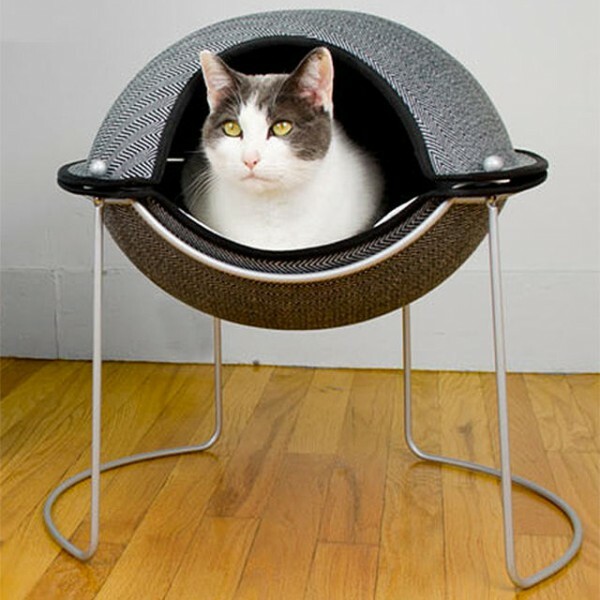 The MiaCara Covo Cat Bed is a bentwood circular tunnel that tips forward so your cat can keep an eye on the comings and goings while still feeling completely protected by the tunnel’s sides and what makes the Covo even better is just how awesome is how it is designed to be a piece of furniture, making it paw-fect for your living room, or any room for that matter. 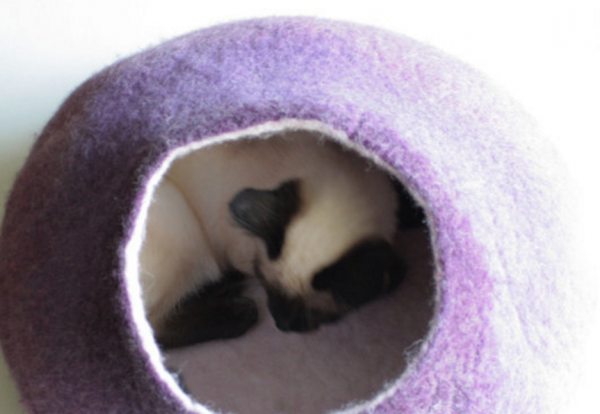 Some cats like their beds to be part of a multi functional unit, like the MiaCara Vista Climbing tower. This structure is a climbing facility, a scratching post and an elevated, covered, lambs wool hammock. 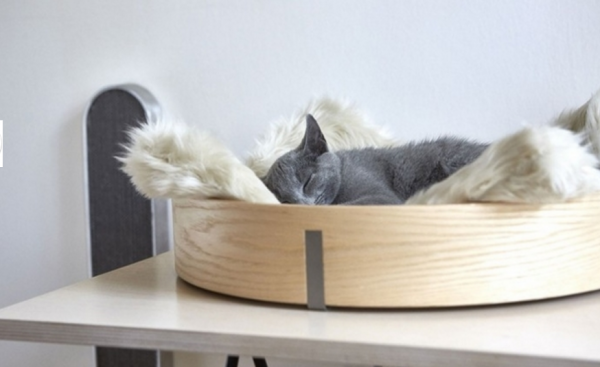 If your cat likes nothing better than to curl up next to your work station, why not indulge them with their very own MiaCara Anello Cat Basket made from ash or walnut bentwood shaped into a tray for a streamlined minimalist look. 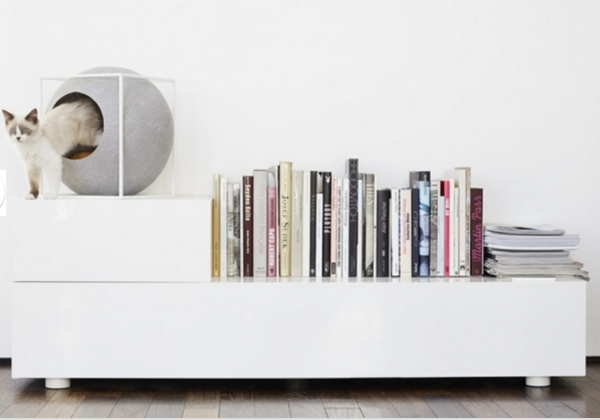 The basket is kept up off of your furniture via stainless steel feet. 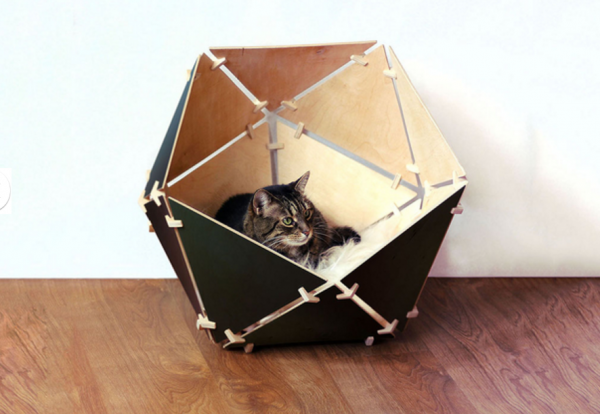 If you prefer a more geometric aesthetic, designer Ilshat Garipov has created the purr-fect multi sided icosahedral flat pack cat bed called the Geobed. 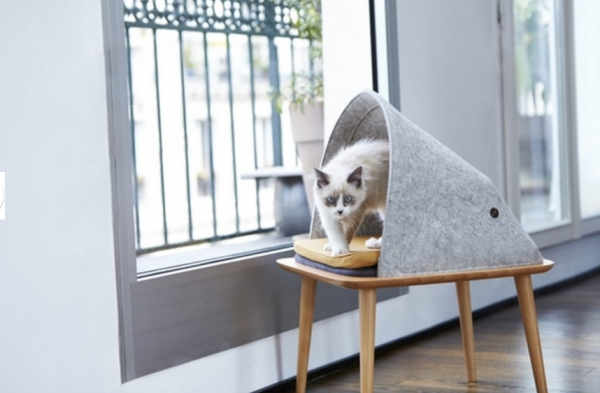 Another geometric designed cat bed is The Cube by Meyou Paris. 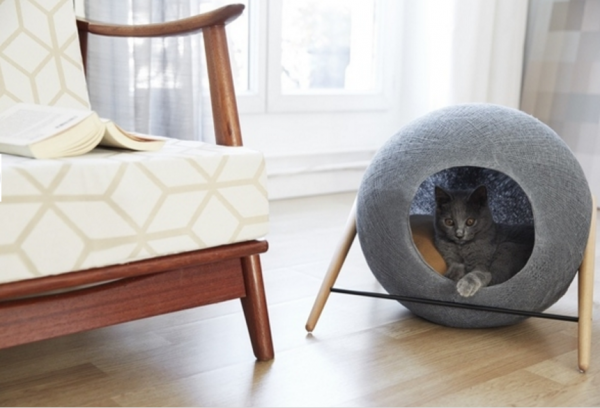 The Cube is a powder coated steel frame that holds a soft, woven cotton globe, like a giant ball of yarn that has been hollowed out, and we all know how much cat’s love balls of yarn! Meyou Paris also has a cat home that is more organic in shape. Called The Bed, it has a mid century style beech wood base and a 100% wool felt tent covering. The Ball by Meyou Paris has a base of both steel and beech wood with the wood slid up over the steel like leggings. The ball is similar to the one in The Cube but is just a bit more elongated. 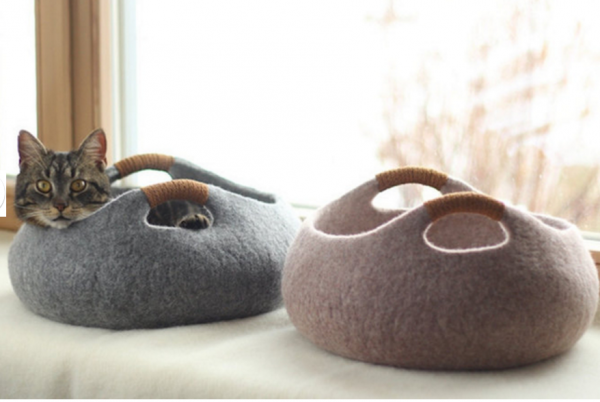 Elevele Cat Baskets are cozy handmade felted 100% merino wool cat baskets complete with handles for carrying your favorite feline from room to room. While these soft colors are gorgeous, they also com in 20 other colors if you prefer more of a punch. Does your cat like the great outdoors? 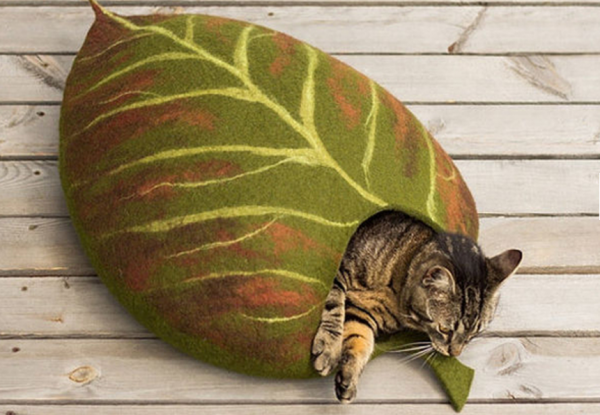 If so your cat will love the Leaf by Elevele. I can just see one of these tucked underneath a large specimen plant, that would be so much fun! Cute as can be is the Houseleek by Elevele. 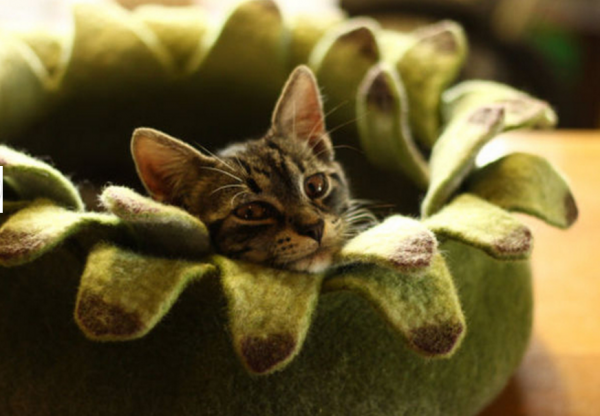 With Sedums all the trend in both indoor and outdoor landscaping, a Houseleek cat bed seems the paw-fect choice. 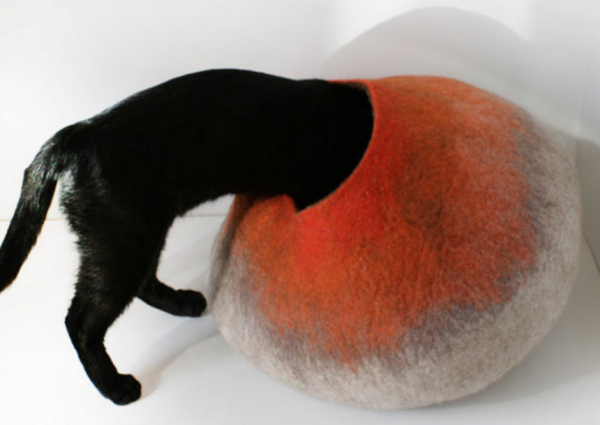 Felted Cat Cocoons by Vaiva Nat have a more abstract aesthetic that still feels very organic. Handmade wet or needle felting techniques where used in the cocoons which are made from merino wool in a smoke free environment. If I where a cat this is exactly where I would like to be! 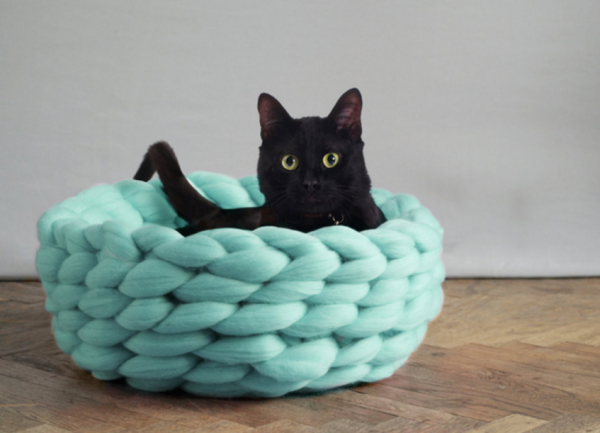 Oversized knitting has been showing up everywhere in home decor so it stands to reason that it would also show up in the form of a cat bed. 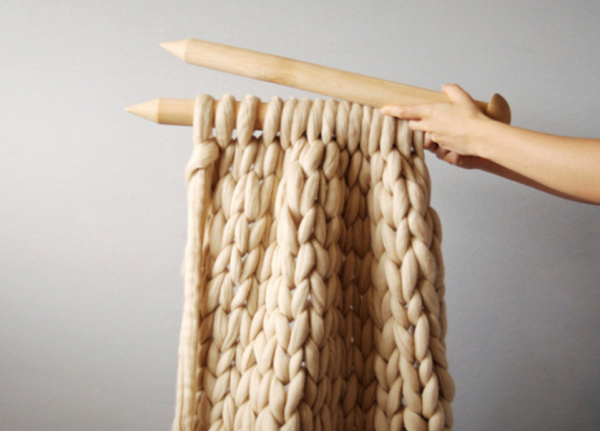 This Ohhio design is made using giant needles from 100% merino wool. Like I said, the needles are giant! 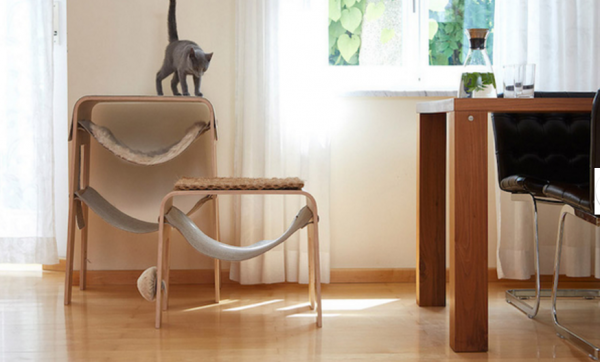 The Kitty Kasa by Arni Says is a modular system of kitty cubbies, scratching posts and all around fun time, but there is a serious side to these adorable Kitty Kasa’s. 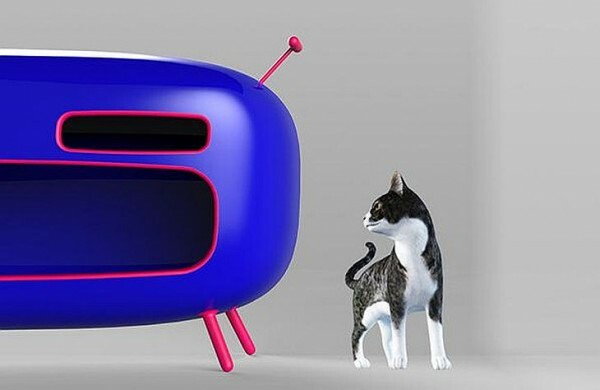 They where originally designed for the ARNI foundation no kill animal shelter in Florida, and when one of these cubic sells, 100% of the profits support the shelter. 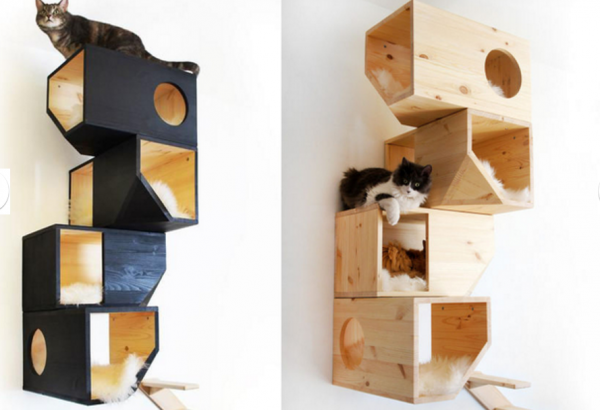 Lycs Architecture also makes a modular system for cats called the CATable 2.0. While the 4 modules are for cats, they are also for humans to store books, mementos, etc. 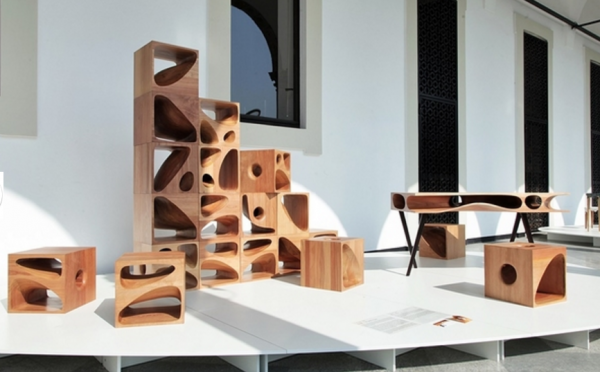 or simply use the cubes as stools or tables. 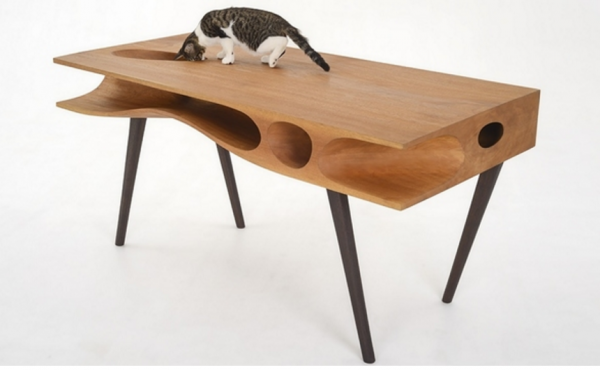 The original CATable is a desk that solves the issue of your cat wanting to be near you while you work, with the CATable they can hang out in the organic voids beneath the desk surface leaving all your papers and pens intact, of course there still is access to your work surface via one of the voids, so maybe your papers aren’t quite so safe after all. 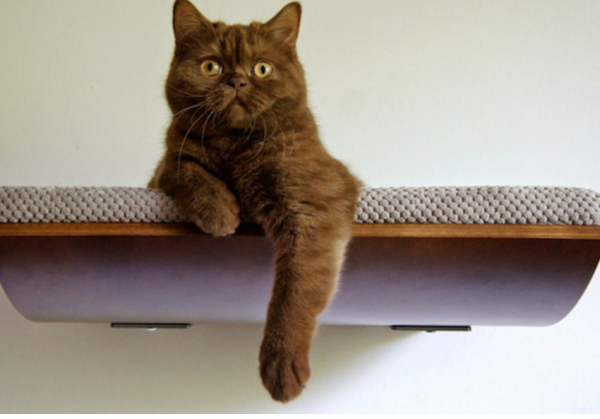 If your cat literally likes hanging out, there is the cozy and dozy wall mounted Chill Cat Perch. What cat wouldn’t want their very own wall shelf, surveying the world from a cozy curved oasis that comes complete with a kitty mattress. 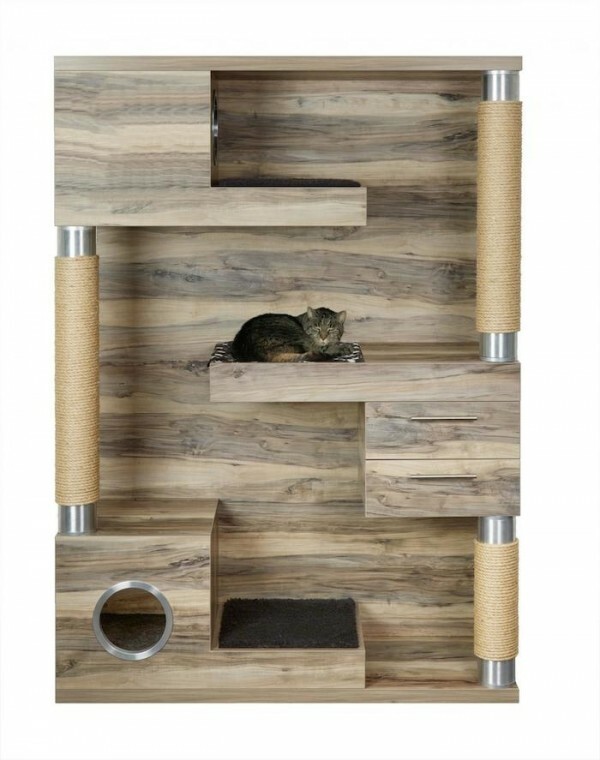 If you have more than one cat the Catissa solid pine Modular Cat Climbing Tower is the answer, it even has cantilevered steps that lead to the climbing, hiding, perching, playing and sleeping stations which I might add come with removable sheepskin cushions. 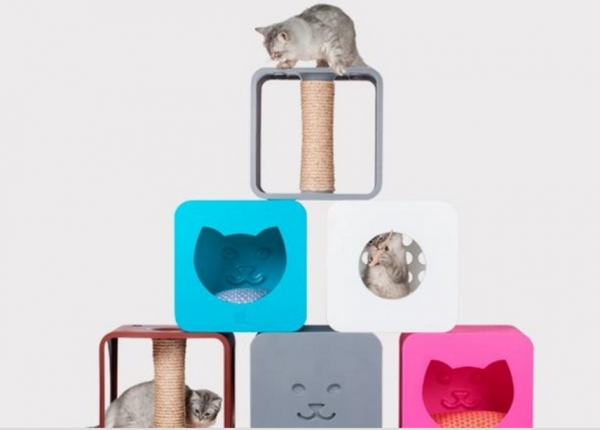 Catframe is a single unit filled with scratch columns, cubicles, pillows and caves for your cat(s) and storage for the humans where cat toys or treats or any number of items can be hidden out of sight. While we love this wood plank look, it also comes in virtually any color of the rainbow. The very dapper Hepper Pod Cat Bed is covered in Herringbone fabric and the classic black and white pattern would look amazing in just about any style of interior design but what I really like about it is the fact that the top is removable and on a hot summer’s day that is a must. 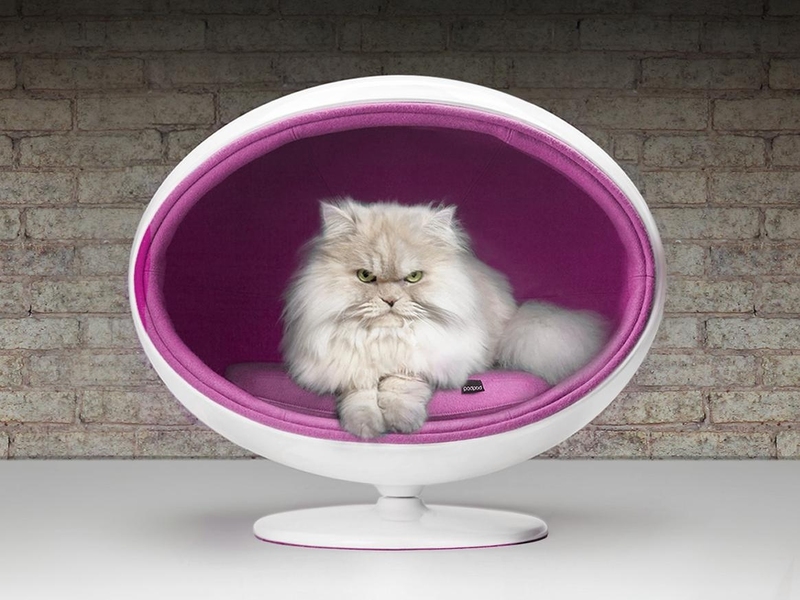 The Padpod Pet Bed by Bark & Miao has a 60’s vibe reminiscent of the bubble chair by Aarnio Eero. The interior of the Padpod has padded, vibrantly colored cushions made from 100% Lavene wool. The Petmonster by Subinay Malhotra come with a few high tech features such as an integrated motion sensor that can communicate with your smart phone.